The yoga wedge is a very versatile tool that can be used in many different ways to add support and length for many different postures. For example, the wedge can be placed under your heels, sit bones, or knees when practicing forward-bending poses to make it easier to place your hands flat on the floor without compromising correct form and posture. 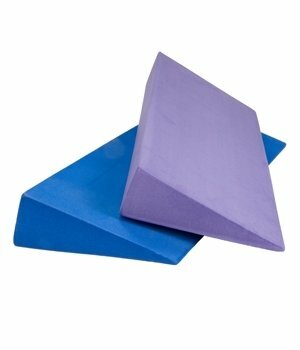 Our high-density foam yoga wedges are made of non-toxic eco scratch-resistant EVA foam. They are durable, lightweight, individually wrapped, and come in your choice of either blue or purple.